Home | Contacts | Questions? A diagram showing the three AIM instruments taking measurements. 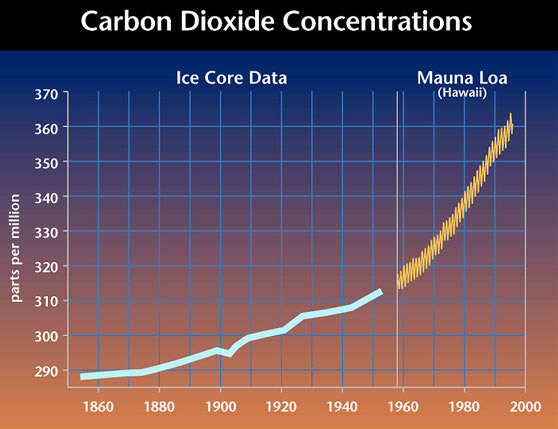 Carbon Dioxide Concentrations PMC formation requires cold temperatures; thus global CO2 changes may be one cause of increasing NLCs. 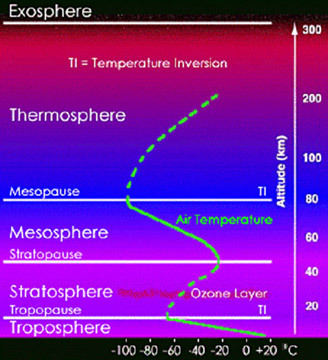 CO2 buildup in the lower atmosphere causes warming but increases in the upper atmosphere should cause cooling. 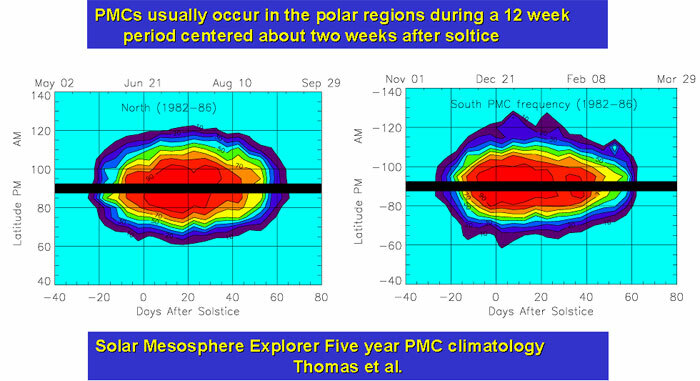 Limited data suggest large mesospheric cooling; newer data give mixed results. H2O chemistry must be important since major NLCs consist of water ice. 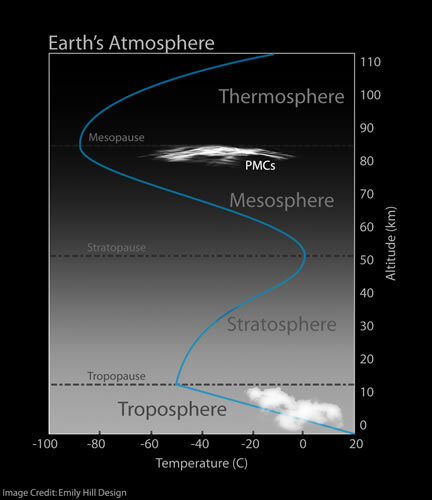 Poor knowledge exists of how NLCs nucleate, the environment for nucleation and how the mesosphere responds to forcings. 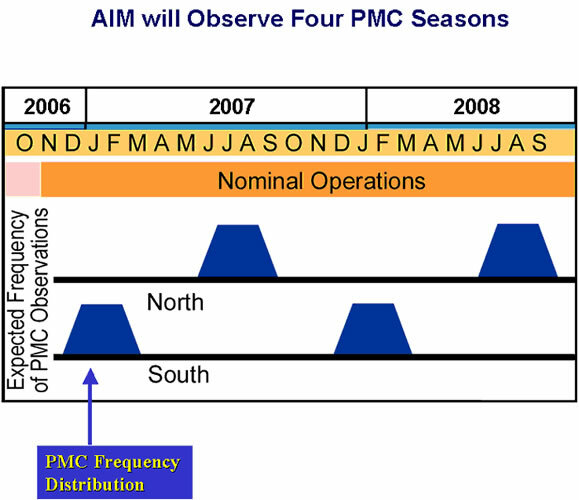 NLCs Occur Near the Cold Summer Mesopause Cold temperatures and H2O (water) appear to be essential for PMC formation. What are noctilucent or "night shining" clouds? * They are the highest altitude clouds in our atmosphere ( ~ 82 km). * They form at coldest place on Earth (~130 K) in polar summers. * They were first reported in 1885. * They have been increasing over the past 30 years. 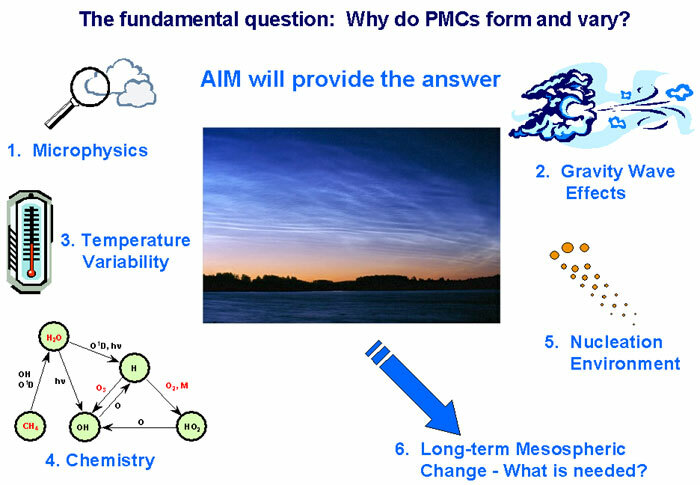 PMCs display complicated structure driven by atmospheric dynamics. 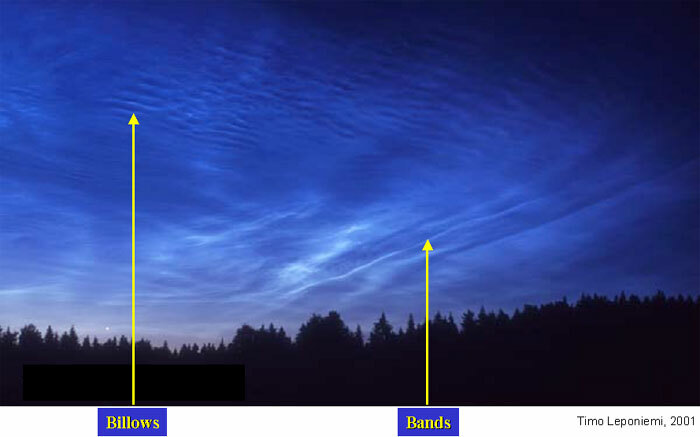 A diagram illustrating when NLCs are visible to observers on Earth. This graph shows increased noctilucent cloud sightings from 1964 to 2002. A graph showing that NLCs are becoming brighter. NASA's Sun-Earth Connection Education Forum.